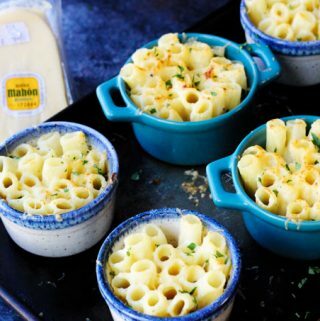 This Cheesy Pasta Bake is made Alfredo Style, with heavy cream and two kinds of amazing Mahon-Menorca cheeses. I made these in the individual ramekins for a perfect portioned side dish. I arranged the rigatoni pasta in the standing position for the ultimate “wow” factor. Serve this on your Holiday table alongside an awesome meat dish and everyone will surely be amazed. This is a sponsored post by Mahon Menorca Cheese. I am participating in bloggers’ challenge in using Mahon-Menorca cheeses. I have been provided with 3 types of cheeses to create some awesome recipes. 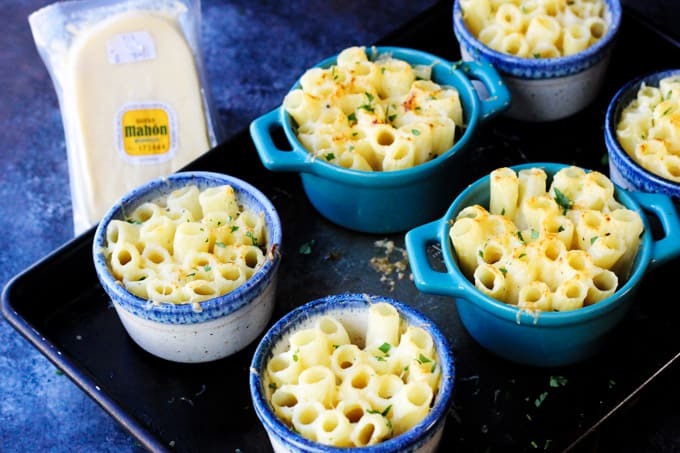 This Cheesy Pasta Bake is the one that I will submit as a “side dish.” However, if you love this cheese as much as I do then do stay tuned for more recipes with Mahon-Menorca cheeses. I’m sure you’ll love them too. Check my other two recipes in this challenge: Pizzette with Roasted Pepper Pesto and Garlic Shrimp and Veal Rollatini with Menorca Cheese, Roasted Peppers and Basil in Tomato Olive Sauce. For those of you who follow this blog, you’ll know that I come from Poland, where we celebrate Christmas for 3 days. Yes, 3 days! They are Christmas Eve, First Day of Christmas and Second Day of Christmas. I shared a bit about this tradition in the post where I shared my recipe for the Authentic Polish Pierogi with Potatoes and Cheese. Anyway, the Christmas Eve dinner is the most important for us and it comes replete with a full menu of specific dishes. But, for the next two days, we can serve whatever we want. In fact, the more festive the dish, the better. My mom was always very creative with her Christmas dinners. I like to do the same thing too (go figure). 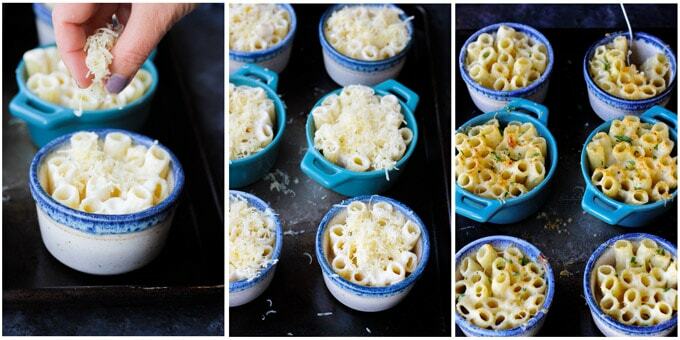 So why Cheesy Pasta Bake in Individual Ramekins? First, it’s pasta and who doesn’t love it? 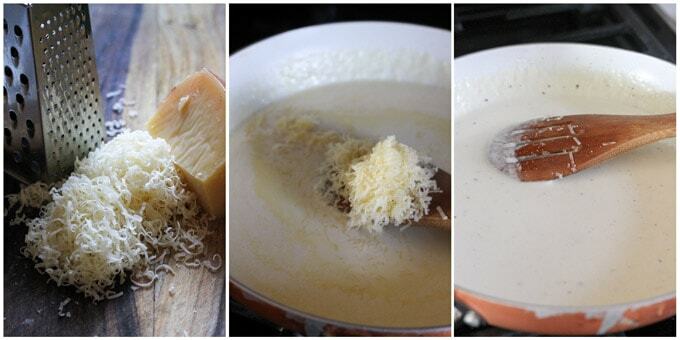 Second, it is smothered in an Alfredo-style sauce made from heavy cream and cheese. Third, Christmas is once a year so everyone could, and in fact, should indulge some. Fourth, it’s quick and easy to make. And last but not least, it looks pretty AWESOME! At the end of this post, you will find a printable recipe with all the measurements, specific instructions and nutritional information. Here, I want to show you how this dish is made. Step 9: Sprinkle semi-cured Mahon Menorca cheese on top and broil for approximately 5 minutes, until bubbly and golden on top. When serving this dish, make sure that your guests know that the ramekins may still be hot so they should consume with caution. But the end result is spectacular. The sauce envelopes the holes in the pasta and the finished product is soft and cheesy at the bottom, and slightly crunchy with extra bubbly cheese on the top. SO GOOD! 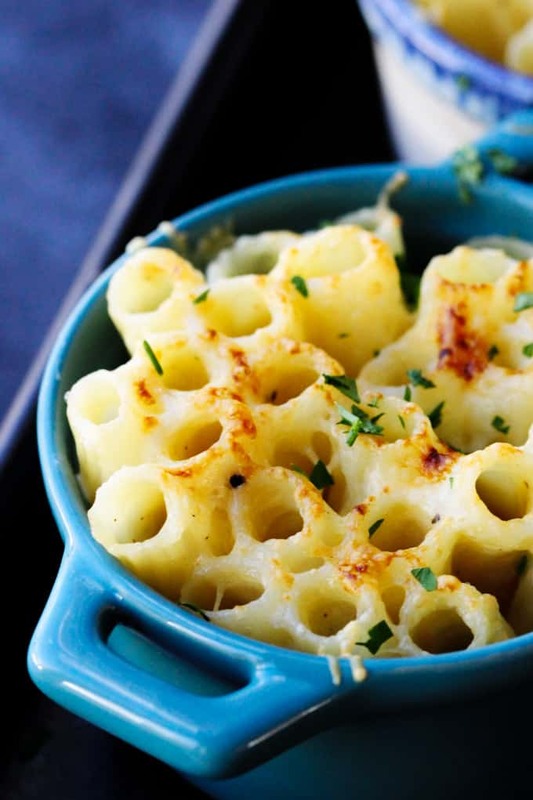 This Cheesy Pasta Bake can go great with quite a bit. If you have a special meat that you serve on your holidays (whether it’s lamb, turkey, beef or pork) this dish will compliment them all. Now, let’s talk about cheese! Last year I partnered up with the Mahon-Menorca cheeses producer and created two awesome recipes for the Holidays. For an appetizer, I made these Mahon-Menorca Pinwheels with Serrano Ham and Fig Jam, and for the main course, I made Pan Seared Ribeye with Cracked Pepper Mahon Menorca Cheese Sauce. Check them out. But my main takeaway was that it was a pleasure to work with these cheeses. It’s no secret, great recipes are borne from great ingredients. 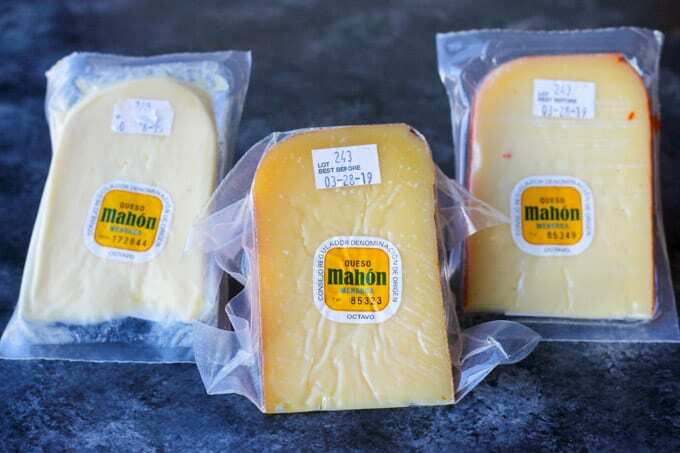 Mahon-Menorca Cheese is a product with a Protected Guarantee of Origin (“PGO”). It means that this is a product which is very closely related to the geographic area where it’s produced – the island of Menorca. TENDER. Soft and creamy. Yellowish/white in color, with very little developed crust. Its taste is milky with slight undertones of butter. It’s aged for 21-60 days. SEMI-CURED. Characteristic and unmistakable. The crust of this cheese is orange, and the cheese is firm yet easy to cut, showing irregular holes throughout. Its milky in taste and the flavor is more developed, with reminiscences of toasted nuts and dried fruit. It’s aged for 2-5 months. CURED. A delicacy for cheese connoisseurs. Its texture is firm and hard. It’s less creamy and in advanced stages of maturity – it breaks, flaking upon being cut. It has a very developed flavor and aroma, with a complex and intense taste. This cheese is aged more than 5 months. There is also a new one, a Traditional Style cheese made with Raw Milk that’s aged for 6 months. It’s also very complex and intense. Where to find Mahon-Menorca Cheese? All the best grocery specialty stores across the county. 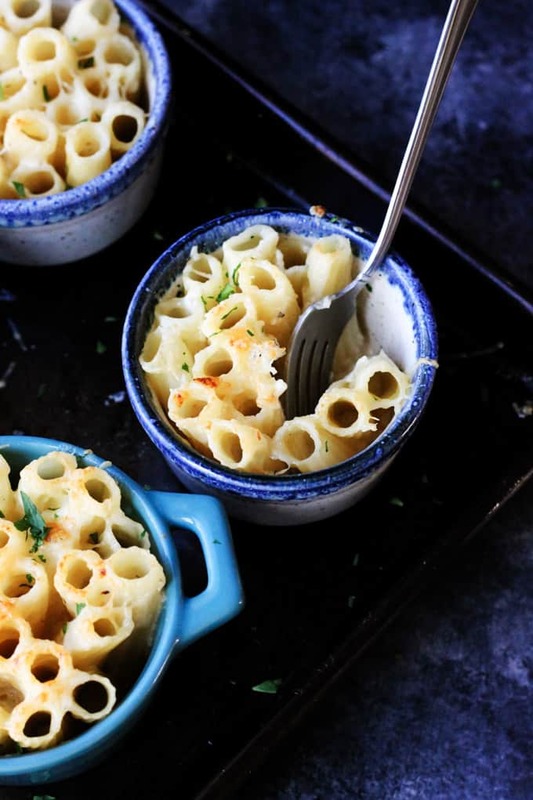 This Cheesy Pasta Bake is made Alfredo Style with heavy cream and two kinds of amazing Mahon-Menorca cheeses. I made them in the individual ramekins for a perfect side dish portion size. I arranged the rigatoni pasta in a standing position for an ultimate "wow" factor. Serve this on your Holiday table alongside an awesome meat dish and everyone will be amazed. 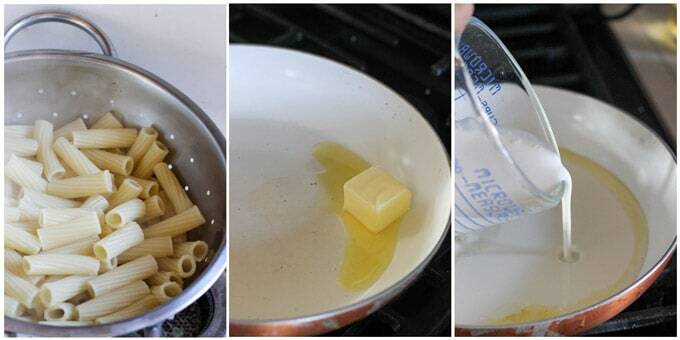 If your sauce is too thick, loosen it up with the reserved pasta water. Start with 1/3 cup and up to 1/2 cup of pasta water. 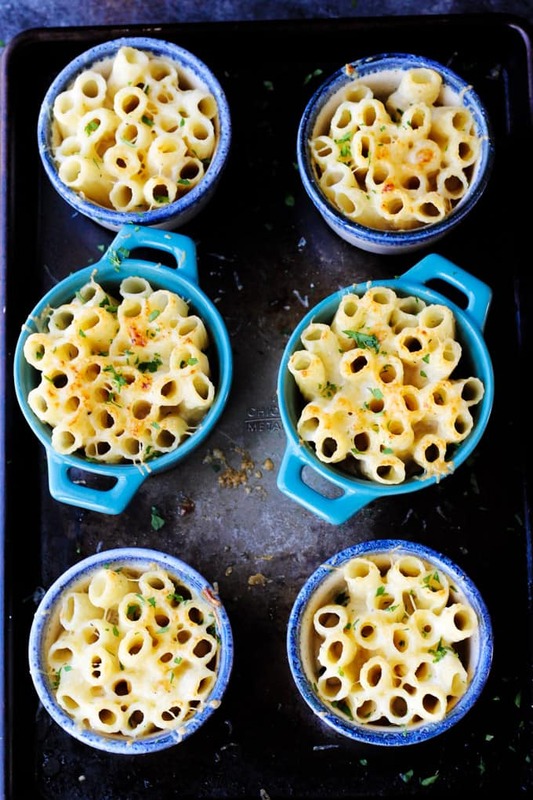 The consistency should be not too thick but still saucy enough to adhere to the pasta. Cool off your pasta slightly so it is easy to handle. 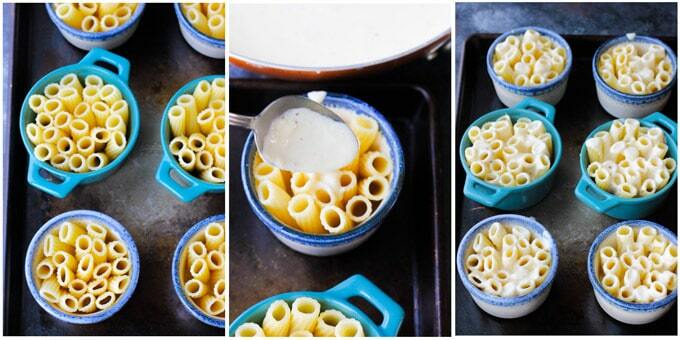 Then arrange you rigatoni pasta in the individual ramekins in standing position. Pour over sauce to come up to about half way of the hight of the ramekins. Sprinkle semi-cured Mahon Menorca cheese on top and broil for approximately 5 minutes until bubbly and golden on top. You can sprinkle with parsley for garnish and serve as a side dish. In the recipe, I used the amount of cheese I used for this recipe but you can go up the notch if you like it cheesier. I love your presentation here with the ramekins! It looks so elegant and is perfect for potion control. 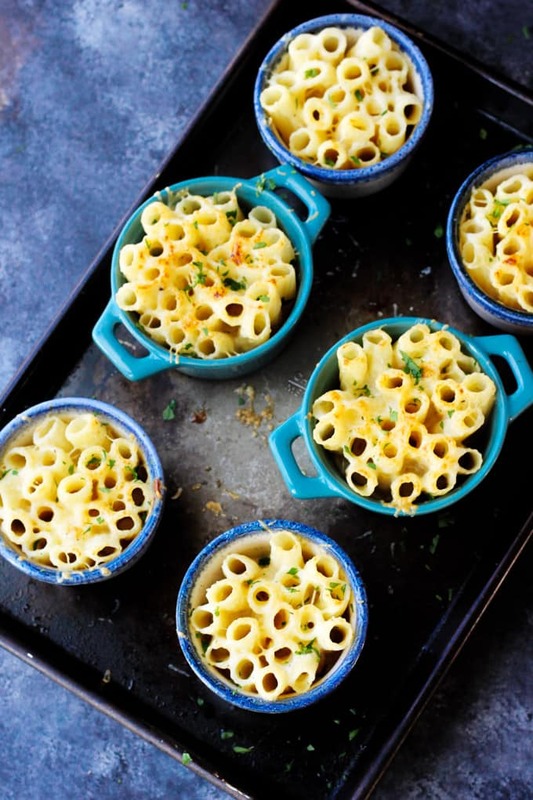 This pasta bake sounds wonderful! I know what you mean 🙂 They are really good! You had me at “CHEESY”! Ha! This looks fabulous, I love the presentation, too!